Pogo Island's setup is simple and easy to use. Menus are clearly labeled, but the Poppit! demo is located in Extras - not in Multiplayer (where a new player might initially look for it), not as its own selections, and not in multiple locations (which might make it more accessible to newbies). There is a multi-step forced opening sequence. The download takes around 50 seconds. All of the selections in the menu system are large, well-defined, and separated enough that you won't accidentally be tapping on the wrong choices from a mis-tap. The menus are also themed to the game's island look. Tapping on the screen is pretty simple. The balloons are a little small and rather close together. For people whose level of coordination is at (or above) standard, the game is easy to play. For some younger players, this could create frustration when a lack of coordination might lead to inefficient gameplay. Allowing for a step of zooming in and out would open the game up to a whole additional group of players. Their target audience is people 18 and older that have (or can set up) an account at www.pogo.com [External Link]. Being on the Nintendo DS, however, their potential player base consists of a much broader audience. I'm going to attack content in three separate categorys for Pogo Island: graphics & sound, the content that is, and the content that isn't, beginning with graphics and sound. The graphics of Pogo Island's Poppit! demo are fine. Any complaint I could make about the animation (the slow, awkward movements of Spike The Cactus on the upper screen) where a choice by the designers and not a shortcoming of the programming. The music is fine for a very short period of time, but then it becomes too repetitive too quickly and then becomes too grating and too annoying. The word "droning" comes to mind. The sound effects - specificly the one that indicates that the balloon you tapped is not eligible to be popped at the present time - are somewhat helpful, but not enough to overcome that annoyance that is the music after the first game. Playing with the sound off is recommended if you're playing multiple games. The content that isn't: ...Pogo Island features five converted web-based mini-games. None of them take up an extremely large amount of space and any one of them could be a demo. All of them together are too large for a single demo, and that would sort of defeat the purpose of buying the game (to a small extent), so that's not what I'm suggesting. Allowing for any one game to be sent separately as its own demo, and allowing people to send the demo of whichever game would be most liked, or to let them try all five of the games after a grueling session of five separate downloads, would make fans all the more likely to buy the game. This game is very reminiscent of Monopoly/Boggle/Yahtzee/Battleship for me. In Monopoly/Boggle/Yahtzee/Battleship, there are (obviously) four games. Unfortunately, only two of them are available in the Single-Card Download Vs Play. For no good reason, Yahtzee (an extemely simple dice game, for those unfamiliar with it) was not one of them. Like that game, I played all of the games that are available in the normal, single-player experience (though I don't review that here) of Pogo Island. Pogo Island doesn't have Vs Play for Single-Card Download - it took the Demo route. There is no reason, however, that any one of the games couldn't be downloaded. None of them are that large. It almost came across as a last minute addition. There's not even an in-game-accessable rules screen (it flashes once before the first game), leaving the impression that there was a "take it and be grateful" attitude behind adding in the demo. I'm not saying there was - I don't know because I wasn't there - but the point behind a demo is to get people to want to buy the game. The problem is that the more frustrated players are with a demo, the less likely they are to go out and buy the game. The lack of Single-Card Download Vs Play, the fact that only one of the five games is available as a demo, and the fact that certain features (in-game rules) aren't avaiable left me with the feeling that the demo was rather hollow. That rant having been said, Poppit! is an O.K. demo. The gameplay is fine for what it is. Unfortunately, all it is consists of looking and tapping a few times. The depth isn't there for repeated, persistant playthroughs (see: Meteos and Tetris DS). Poppit! is fun a couple of times through, but most people won't find themselves playing for hours on end. Allow for zooming in and out in Poppit! so that it's easier for not-quite-so-coordinated players. Program the ability to send separate demos of any one of the five games. Include a rules screen that can be accessed from within the game (while paused?). Permit players to turn off the music and leave the sound effects on. 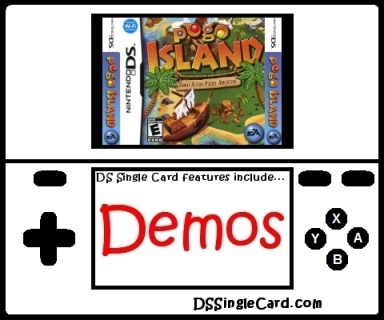 Click here to return to the DSSingleCard.com Pogo Island profile.